When clients choose their wedding ceremony on the beach, it gives me a great opportunity to be creative. Palmetto Dunes in Hilton Head South Carolina, is one of those venues I love. I have always felt that when you have your family and friends at a wedding there should be a way to incorporate that into one photo. I love capturing images that are unique and different, images that will stand the time. With every client that commission me to have the honor and privilege to capture their special day, I always months prior to the wedding, design with them the perfect wedding timeline. As we have this phone conference or in person, I there to give the said clients, many different great ideas for spectacular images that I have mastered to capture. These clients had a very small be quaint wedding with family and friends, at the time of our conference they wanted an image just like that but really had no idea on how they would have that image of everyone. Knowing that the wedding ceremony was on the beach at Palmetto Dunes, I offered my advice to have that image captured right after the ceremony. My advice to make this image pop with that wow factor, was by having pedals of roses thrown in the air by their friends and family. In less then 8 minutes, I managed to advise everyone where they should be. 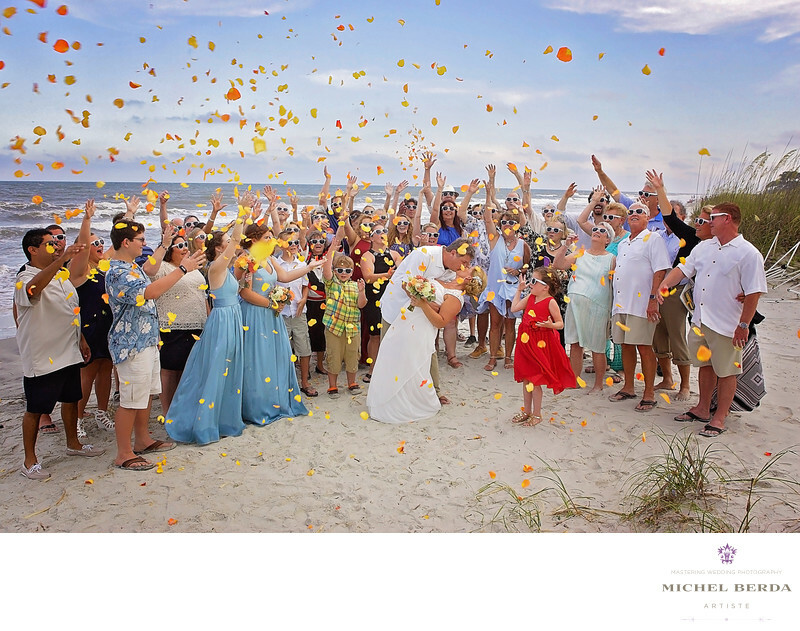 Look at this image, you almost feel like the pedals are still moving, the joy and happiness in everyone and the focal point being the bride and groom gives this image, that wow factor that I captured at Palmetto Dunes in Hilton Head South, Carolina.